Readings: Genesis 1: 1-2: 4a; Psalm 8; II Corinthians 13: 11-13; Matthew 28: 16-20. In the name of + the Father, and of the Son, and of the Holy Spirit. Amen. Although Trinity Sunday is one of my favourite Sundays in the liturgical year, I am aware that many of my priest colleagues and friends are reluctant to preach on this Sunday for fear of heresy. The difficulties of preparing for this Sunday are compounded because this is the only festival in the Church year that celebrates a doctrine rather than an event or a person. 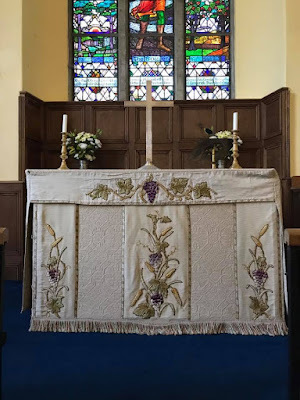 But perhaps if we approached Trinity Sunday thinking about how to celebrate our life in the Trinity rather than explaining our doctrine about the Trinity we might have very different sermons, with very different approaches. Heavy on the celebrations, light on the explanations – would it work better? In the Western traditions of the Church, Trinity Sunday is the Sunday following the Day of Pentecost. Interestingly, Trinity Sunday is a very Anglican day too: Thomas Becket (1118-1170) was consecrated Archbishop of Canterbury on the Sunday after Pentecost, and his first act was to ordain that the day of his consecration should be held as a new festival in honour of the Holy Trinity. This observance then spread from Canterbury throughout the Western Church. Trinity is a popular name for churches and colleges throughout the English-speaking world. It is the dedication of Holy Trinity Church, Rathkeale, and so we are celebrating the Festal Eucharist this morning. Trinity Episcopal Church opened as a proprietary chapel in Catherine Street, Limerick, in 1834 and was associated with a ‘blind asylum.’ The official name of Christ Church Cathedral in Dublin is actually the Cathedral Church of the Holy Trinity. But it is also the official name of Christ Church Cathedral, Waterford, and there are Trinity Colleges in Dublin, Cambridge and Oxford, as well as a Trinity Hall in Cambridge. So, why are Anglican clergy, and clergy in general, so reluctant to talk about the Trinity, or so turgid and tortured when they do so? I know that for some preaching can be a difficult task. But sometimes preachers make it difficult – not only for ourselves, but for those who must listen to us. And I wonder why so many clergy who get into the pulpit to preach on Trinity Sunday either descend to the depths of heresy or rise to the heights of lunacy. Question: What does the Church think of God the Father? Answer: He is omnipotent and holy. He created the world and imposed on man conditions impossible of fulfilment. He is very angry if these are not carried out. He sometimes interferes by means of arbitrary judgment and miracles, distributed with a good sense of favouritism. He likes to be truckled to, and is always ready to pounce on anybody who trips up over a difficulty in the Law, or is having a bit of fun. He is rather like a dictator, only larger and more arbitrary. Question: What does the Church think of God the Son? Answer: He is in some way to be identified with Jesus of Nazareth. It was not his fault that the world was made like this and, unlike God the Father, he is friendly to man and did his best to reconcile man and God. He has a good deal of influence with God, and if you want anything done, it’s best to apply to him. Question: What does the Church think of God the Holy Ghost? Answer: I don’t know exactly. He was never seen or heard of till Whit Sunday. There is a sin against him which damns you for ever, but nobody knows what it is. Question: What is the doctrine of the Holy Trinity? Answer: ‘The Father incomprehensible, the Son incomprehensible, the Holy Ghost incomprehensible’ – the whole thing incomprehensible. Something put in by theologians to make it more difficult. Nothing to do with daily life and reality. Nothing to do with daily life and reality? Are these some of the difficulties you could imagine when it comes to thinking and talking about the Trinity? It might be easier on Father’s Day next Sunday [18 June 2017] to talk about our images of God the Father. 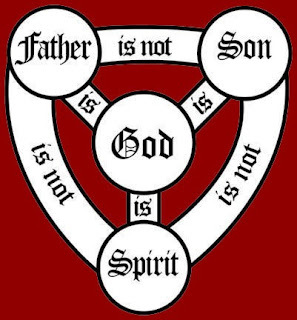 But this Sunday is Trinity Sunday, so allow me to introduce us this morning to some ways of thinking of God as the Trinity. If I were to introduce you to my world, to my story, I might invite you to visit the places that have shaped and made me. I might invite you to imagine what it was like for a small boy to lay awake in his grandmother’s farmhouse in west Waterford, it was so bright outside on a balmy summer’s evening. Downstairs, I can hear the old clock chiming out the time: it’s 10, and a hush descends on the house as the adults settle down in their chairs to listen to the news on the wireless. I hear the black kettle boiling on the open fire as someone prepares to make a pot of tea. Outside, a pigeon is still cooing in the thatch, I imagine I can hear the abbey bells ringing out the time across the fields, and I know I am safe and loved in this world. Twenty or so years later, once again it is late at night, in the top storey of a tall house in a narrow street in Wexford town. It is comforting to hear the clock of Rowe Street church count out the hours. Is that a late train I hear trundling along the quays? A lone voice in the Theatre Royal braving a late rehearsal for the opera? And I am so looking forward to the Festival Service in Saint Iberius’s Church. Let us move forward another two decades or so. I cannot sleep in this house in suburban Dublin. But I can hear my children snoring contentedly in their own rooms. Outside, the unseasonable rain is pelting down, the wind is rustling through the cherry tree outside, and I wonder whether all the cherry blossom will be shaken down and washed onto the grass below by the time morning dawns. We can use words not only to tell our stories, but to paint pictures, to invite others into our communities, into our families, and into our lives. Now that you have heard and seen what has shaped me, where I have been formed, what made me feel loved and secure, now that you have been invited into my story, my family, and know me, we are ready to sing the same songs, to sit together at the same table. Why, we might even dance! The Trinity is an image of God, a perfect community, a community of God that invites us to share God’s story, to sit at table with God, to sing songs with God, … all the things we’re doing at this Eucharist this morning. 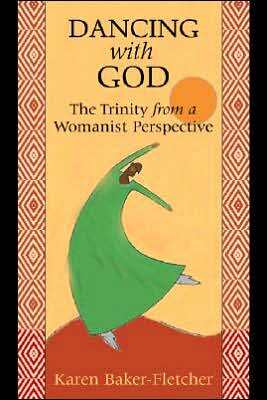 Why, as Karen Baker-Fletcher said ten years ago in her book, the Trinity could be God’s invitation for us to dance with God [Karen Baker-Fletcher, Dancing With God: A Womanist Perspective on the Trinity (St Louis: Chalice Press, 2006; 2007)]. Two of the great Early Fathers of the Church, Saint Gregory of Nazianzus and Saint John of Damascus, use the term περιχώρησις (perichoresis), an image of going around, enveloping, to describe the mysterious union of the Father, the Son and the Holy Spirit. Clark Pinnock writes: ‘The metaphor suggests moving around, making room, relating to one another without losing identity’ [Clark Pinnock, Flame of Love, A theology of the Holy Spirit (Downers Grove: InterVarsity Press, 1996)]. There is a play on words – a pun on the Greek origins of the word – that allows us to think of creative choreography, to imagine a dance of reciprocal love. This divine unity is expressed in the relationship of the three as one, for relationship is at the heart of the unity of the three-in-one. It is a relationship that is mutual and reciprocal. The Trinity tells us that shared life is basic to the nature of God: God is perfect social relationship, perfect mutuality, perfect reciprocity, perfect peace, perfect love. ‘As a circle of loving relationships, God is dynamically alive.’ The three persons of the Trinity are caught up in an eternal dance of reciprocity, so intertwined that at times it may appear difficult to tell who is who. They move with choreographed harmony. The love emanating from within cannot help but create, for it is the nature of love not to harbour and to hoard but to expand and to create. God has, from the beginning, been wooing creation to dance. The community of God desires community with us. You and I are being courted, God wants to dance with you, and with me. The love that created us and our world is the same love that longs to be in fellowship with us. When we worship in spirit and in truth, do others, does the world, see us united as one, bound by love, dancing in harmony and flinging out new creation from within our midst? And do we call others to dance with us? The Russian icon writer Andrei Rublev tried to create the same picture in a different way. In his famous icon of ‘The Visitation of Abraham,’ he depicts three visitors who arrive at Abraham’s door. The guests become the hosts, the host becomes the guest, and Abraham is invited to a meal that is past, present and future. It is every domestic meal, it is a foretaste of the Eucharist, it is a foretaste of the heavenly banquet. In welcoming strangers, Abraham is entertaining angels. 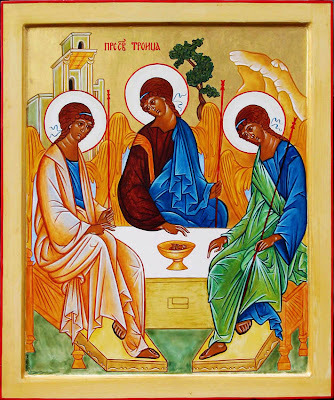 But in entertaining angels, he is invited into communion with God as Trinity. It is a moment in the past, a moment in the present and a moment in the future, when we shall all be restored to being in the image and likeness of God our Creator. God, in creating us, creates out of love, making our destiny eternal life with him. We are created to experience life within the Trinitarian communion of persons. ● we all need company. God the Father creates us and cares for us; God in Christ identifies with our suffering, takes on and takes away our suffering; God the Holy Spirit enlivens our communities, gives us that divine measure. God has, in a very real way, entered into the mystery of our humanity, so that we may enter into the mystery that is his communio personarum. God invites us in creation, in Christ, in the Church, in the Word, and in the Sacrament, to be in union with God, to share God’s story, to sit down and dine with God, to sing and dance with God, to find our inner dwelling with God, and to be at one with God. And that is the purpose and the fulfilment of Christian life. And so, may all we think, say and do be to the praise, honour and glory of God, + Father, Son, and Holy Spirit. Amen. for you live and reign, one God, for ever and ever. Peace to you from God our heavenly Father. Peace from his Son Jesus Christ who is our peace. Peace from the Holy Spirit the Life-giver. The peace of the Triune God be always with you. Canon Patrick Comerford is Priest-in-Charge, the Rathkeale and Kilnaughtn Group of Parishes in the Diocese of Limerick, Killaloe and Ardfert. This sermon was prepared for Trinity Sunday, 11 June 2017.